Drumplay - "s/t" / "Live At Nelson Ledges"
As you might guess by their name, Drumplay is a percussion ensemble that plays all manner of instruments meant to be bashed upon. Their music is improvised and the inspiration is Afro-Cuban, Brazilian and Middle Eastern rhythms, though there is a strong element of jazz to be heard as well. Drumplay has strong ties to Cleveland, Ohio's spacerock community having appeared at all three Strange Daze festivals and have shared the bill with space bands for club performances as well. My introduction to the band was when they opened for Gong this Summer. At that time the band included four or five members and they were joined for a good portion of their performance by Didier Malherbe, a combination that produced upbeat and spiritually uplifting music leaving a solid first impression on this listener. 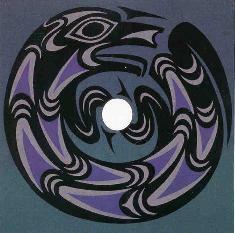 My second experience with the band was a yet to be released CD loaned to me at Strange Daze by band member James Onysko. With hammered dulcimer and sax accompanying the percussionists this was an impressive blend of jazz and world music with a free spirited feel that was a step beyond the live experience I'd had previously. 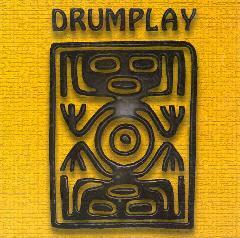 On their debut CD, Drumplay is a trio of James Onysko, Warren Levert, and Doug Turner. The first song, at 16 minutes, is pure percussion, and though the musicians meld well together and the world music influences thrive, my attention didn't hold too well throughout. I think my initial experiences with the band has left me preferring the expanded instrumentation and resulting fuller music. Subsequent tracks that include vibes (I think?) have a little more happening but still lack the excitement of my prior encounters. "Live At Nelson Ledges" has a slightly different lineup. In addition to Onysko and Levert is Brett Brandon, Sam Phillips, and Matthew Abelson on hammered dulcimer. I have to say the addition of the hammered dulcimer does wonders for Drumplay's music. The opening 17 minute track begins with a deep bash to a gong, and then proceeds similarly to the music on the debut disc. But the intensity and varied activity increases as the track progresses with loads of percussion, vibes (I'm calling them vibes again but they aren't credited as such), and the dulcimer. Cool stuff that has a great groove to it. Overall, I have to say it's the new disc I'm looking forward to and would recommend interested beginners to look for that one. Drumplay is an ensemble that shines as additional instruments are added. You can visit Drumplay at their web site.